A worker suffered serious injuries while preparing for a roofing job. He and another worker picked up a large piece of plywood, one worker at each end, to remove it from the roof. The workers did not realize the plywood was being used to cover a hole that had been cut in the roof for mechanical services to the building. As they moved the plywood, one worker fell through the hole, approximately eight metres. He broke both arms and sustained injuries to his head, back and internal organs. WorkSafeNB determined the cause of the accident was a failure to secure and identify the cover over the hole. The workers had not been told about the hole in the roof and the plywood being used to cover it, and there was no sign or warning posted. Guardrails are the preferred method for protecting workers near floor and roof openings. However, guardrails may not always be practical due to narrow access. In that case, an alternate cover must be installed and marked. Use planks, plywood or steel plates for covers. 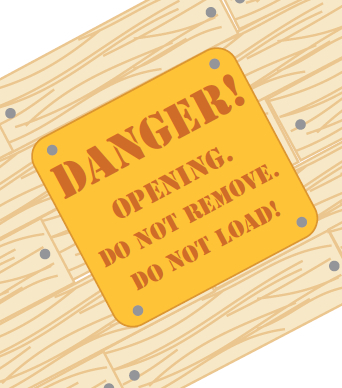 In some cases, pallet-type designs can make covers stronger and less likely to be removed. Make covers stand out with bright paint. DANGER! OPENING. DO NOT REMOVE. DO NOT LOAD! Fasten the cover securely to prevent workers from removing it and falling in the hole. 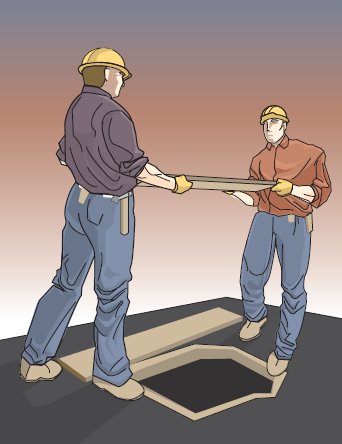 Ensure the cover is strong enough to support any load to which it may be subjected, for example, the weight of a person walking across it. See section 111 of General Regulation 91-191 for detailed requirements regarding openings.